Apple Fritters: Apple Fritters are fried nuggets of cinnamon-flavored batter stuffed with flavorful apple chunks and covered with a dusting of powdered sugar. 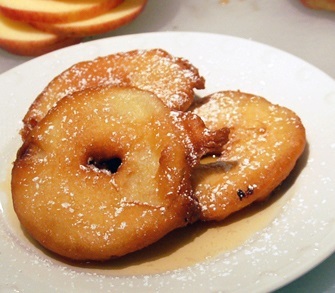 This is vegetarian recipe for Apple Fritters. Mix the flour, 1/4 cup sugar, cinnamon powder, salt, baking powder and baking soda in a medium bowl. Add the sparkling water, buttermilk and vanilla. Stir until the mixture forms a batter. Heat the olive oil and vegetable oil over medium heat, in a heavy based saucepan.